Also serving communities of Travelers Rest, Piedmont. There are 19 Assisted Living Facilities in the Greenville area, with 16 in Greenville and 3 nearby. The average cost of assisted living in Greenville is $3,380 per month. This is higher than the national median of $3,346. To help you with your search, browse the 207 reviews below for assisted living facilities in Greenville. On average, consumers rate assisted living in Greenville 3.8 out of 5 stars. Better rated regions include Simpsonville with an average rating of 4.4 out of 5 stars. Caring.com has helped 21 families in Greenville find high-quality senior care. To speak with one of our Family Advisors about assisted living options and costs in Greenville, call (855) 863-8283. Nestled in the foothills of the Blue Ridge Mountains, Greenville, South Carolina, hosts annual culinary events and art festivals for seniors to enjoy. The city also has a zoo and several museums that make great day trips for seniors residing in assisted living facilities. Seniors age 65 and older make up 12.4 percent of Greenville's population, and the city has 31 assisted living facilities to serve them. These are licensed and governed by the state Board of Health and Environmental Control, Division of Health Licensing to ensure residents receive proper care and a safe place to call home. The cost of living in Greenville is 6 percent higher than the state average and 10 percent higher than the national average. However, the average cost of groceries is slightly lower than the state average, which may make it easier for seniors on low or fixed income to find reasonable prices on necessities. Seniors worried about their personal safety might be concerned about Greenville's crime rate. The city has an overall crime rate that's 73 percent higher than the national average. Greenlink runs a public bus system throughout Greenville, making it easier for seniors to traverse the city. Seniors age 65 and older and Medicare card holders qualify for reduced fares. The Greenville area is home to world-class medical facilities, including Greenville Memorial Hospital and GHS Patewood Memorial, in the event of medical emergencies or illness. Seniors in Greenville may appreciate the mild weather the city gets throughout the year. Year-round temperatures average between 43 degrees Fahrenheit and 80 degrees Fahrenheit. The area rarely sees any snow, but rainfall is common, especially in August. Greenville has an array of community resources for seniors, including the Senior Action, an organization that offers wellness programs, assistance with financial management and lifestyle enrichment programs, as well as three senior centers. Assisted Living costs in Greenville start around $3,380 per month on average, while the nationwide average cost of assisted living is $4,000 per month, according to the latest figures from Genworth’s Cost of Care Survey. It’s important to note that assisted living rates in Greenville and the surrounding suburbs can vary widely based on factors such as location, the level of care needed, apartment size and the types of amenities offered at each community. 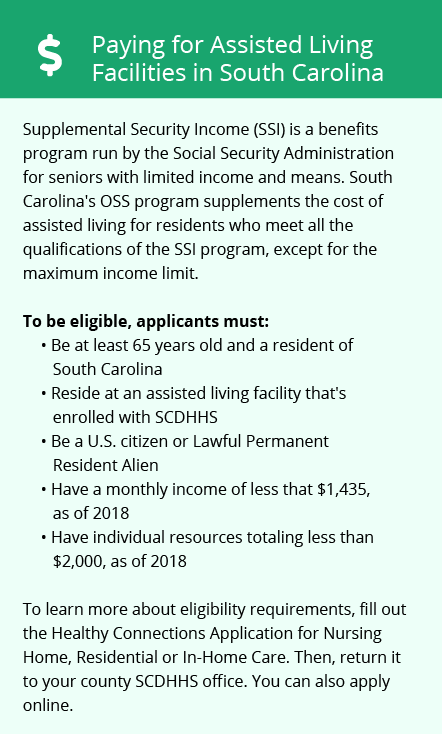 In South Carolina, seniors who need help paying assisted living costs can apply for the South Carolina Community Choices Medicaid Wavier. The state also offers supplemental SSI payments. To see a list of free assisted living resources in Greenville, please visit our Assisted Living in South Carolina page. 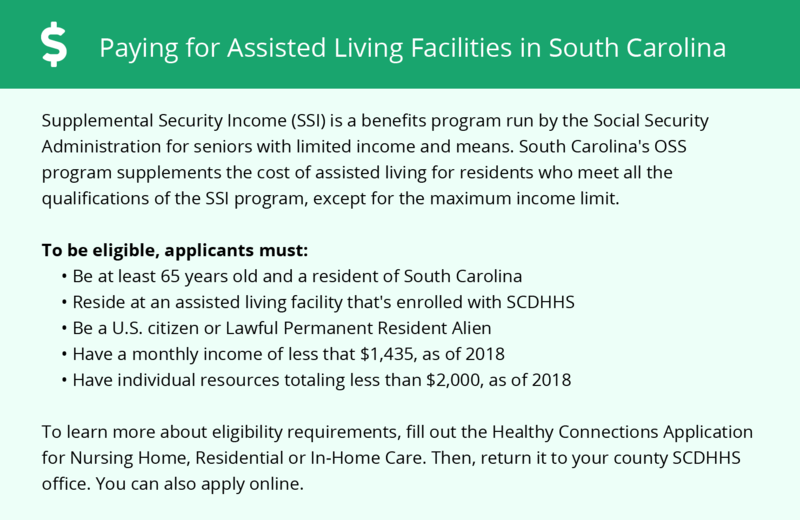 Greenville-area assisted living communities must adhere to the comprehensive set of state laws and regulations that all assisted living communities in South Carolina are required to follow. Visit our Assisted Living in South Carolina page for more information about these laws.